The massive spinning blades affixed to towers 200 feet high can appear on Doppler radar like a violent storm or even a tornado. Wind farms have been blamed for disrupting the lives of birds, bats and, most recently, the land-bound sage grouse. The phenomenon has affected several National Weather Service radar sites in different parts the country, even leading to a false tornado alert near Dodge City, Kansas, in the heart of Tornado Alley. In Des Moines, Iowa, the weather service received a frantic warning from an emergency worker who had access to Doppler radar images. The alert was quickly called off in Kansas and meteorologists calmed the emergency worker down, but with enough wind turbines going up last year to power more than 6 million homes and a major push toward alternative energy, more false alerts seem inevitable. New installations are concentrated, understandably in windy states such as Texas, Oklahoma, Kansas, Colorado and Iowa -- all part of Tornado Alley. 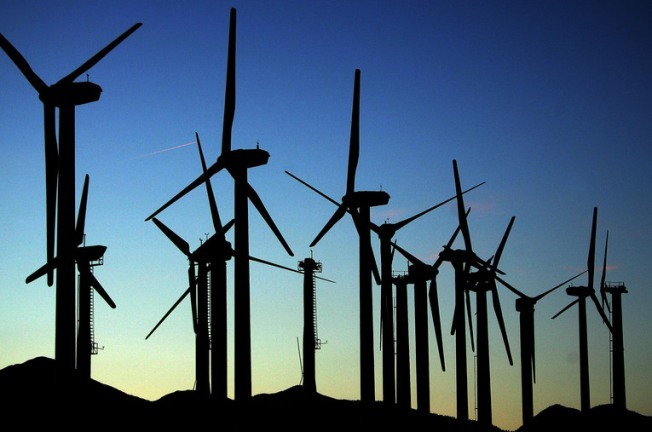 Texas, which has more tornadoes than any other state, also has the most wind power capacity. Dave Zaff, science and operations officer with the National Weather Service office in Buffalo, N.Y., describes the wind farms 20 to 35 miles to the southeast as "more of a pimple or a blotch on your face" that 99 percent of the time will not pose a problem. But what about those busy, high-stress periods when a meteorologist is tasked with making quick decisions as storms grow violent? In a worse-case scenario, a forecaster could disregard a real storm for turbine interference, but, more likely, would err on the side of caution, Zaff said. "If you take a glance and then all of the sudden you see red, you might issue an incorrect warning as a result," he said. Problems began to surface about three years ago and seem to occur where a wind farm is built within about 11 miles of a Doppler site, said Tim Crum, with the weather service's radar operations center in Norman, Okla.
That could become a bigger problem, because the same terrain is attractive for both weather radar and wind farms. "They want to be out in relatively exposed areas, high terrain, those sorts of things," Crum said. "So we sometimes are looking for the same ground, although we're already there." Software can easily filter out buildings, cell towers and mountain ridges on radar screens. Yet because weather radar seeks motion to warn of storms, there's no way to filter out the spinning blades. Microwave radio signals are beamed toward a particular point and meteorologists listen for the "reflection." Experts can pick out the shape of a storm, or a tornado. The splatter of green, yellow, orange and red on Doppler screens that are caused by wind farms can look very much like a tornado or a storm. In Kansas, it was a computer program that picked up on the pattern and issued the alert. A meteorologist who was aware of the phenomenon quickly called off the alert. The weather service is trying to improve its technology so that meteorologists during severe weather events can more easily tell the difference between dangerous storms and wind farms. But there are now discussions about shutting down the wind farms when bad storms roll in. The weather service has no say in where wind farms are sited, though it has analyzed some 500 proposed wind projects in an attempt to cut down on false alarms through better siting and layouts, said Crum. It is also meeting regularly with AWEA, the wind power trade group. Laurie Jodziewicz, AWEA's manager of siting policy, said the association is making sure its members understand the emerging issue and that they consider their projects' potential effects sooner rather than later.